Could the sweet blackfoot daisy hold a cure for cancer? Blackfoot daisy is a West Texas wildflower that likes to hang around. 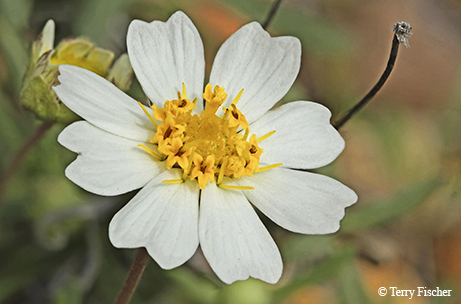 Unlike many Texas wildflowers that bloom for just a few weeks each spring or summer, blackfoot daisy often begins to bloom in late spring and continues flowering into fall. It’s a real pleasure for a wildflower enthusiast like myself to keep running into this particular wildflower throughout its extended season (generally March through November) of beautiful, showy, white-and-yellow flowers. Blackfoot daisy is a perennial herbaceous plant of the sunflower family and is found in the calcareous soils of the western part of Texas, in the eastern margins of the Edwards Plateau and farther east to north-central Texas. It is primarily a southwestern species and is also found in Oklahoma, Kansas, New Mexico, Colorado, Arizona and Mexico. Being a member of the sunflower family means that what might look like one flower really is a cluster or head of many smaller flowers of two different types, white ray flowers and yellow disk flowers. The disk flowers are packed together in the middle of the “head,” while the ray flowers are arranged around the perimeter of the central cluster of disk flowers. Look closely and you might mistake each individual ray flower for a petal of a more typical flower. However, don’t be fooled, as each ray flower is a complete flower all its own, with male and female parts and petals. And the same holds true for the central yellow disk flowers as well. Blackfoot daisy is known by several additional common names, including rock daisy and plains blackfoot. Why blackfoot? If you look on the underside of each of the white ray flowers you will see a small, foot-shaped bract (or reduced leaf) that turns black when mature. It’s a surefire way to identify this little beauty. In fact, the scientific name Melampodium comes from two Greek words: melas, which means black, and podos, which means foot. Those little black feet may not be the most remarkable feature of blackfoot daisy. Recently, a group of medical and pharmacological researchers, including Dr. Susan Mooberry at the University of Texas Health Science Center in San Antonio, isolated chemical compounds from the leaves and branches of blackfoot daisy to look for new anti-cancer compounds. They isolated five such compounds, one of which was new to science. Remarkably, all five compounds were effective in killing human prostate and cervical cancer cells. Much research is still needed to determine if any of these compounds can be made into useful pharmaceutical drugs to treat cancer. Enjoy the blackfoot daisy’s aesthetic beauty, but give a thought to the plant’s potential future benefits to medicine and mankind as well. Did You Know? Blackfoot daisy contains compounds that may combat cancer.